Spartans Will. We Will Too. Individual strength. Collective power. Extraordinary impact. These are the things that make a Spartan. 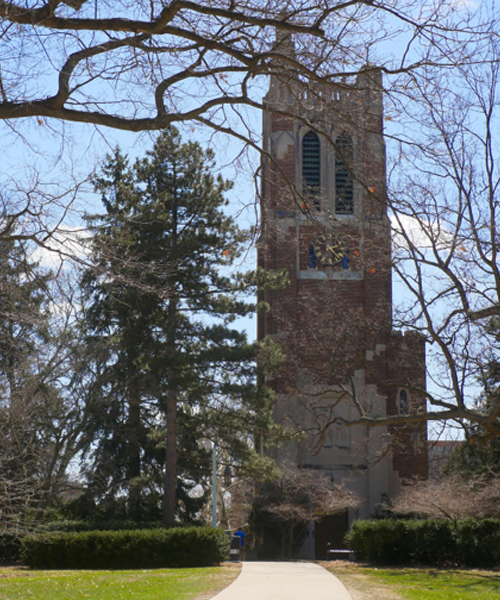 Michigan State University, like MessageMakers, seeks to create positive results for a better world. Like us, they dream big and work hard. And our working relationship with Michigan State University is well established: founder Terry Terry was a member of the inaugural class of James Madison College at MSU back in 1967. Produced a series of recruiting videos for James Madison College -- story-telling what it’s like to be a student and outlining the four majors it provides (Comparative Cultures and Politics, International Relations, Political Theory and Constitutional Democracy, Social Relations and Policy. Created promotional videos for The Wharton Center For Performing Arts – including the video “Wharton Beyond the Stage,” which gives an overview of Wharton’s extensive diversity of programming as a non-profit community-based provider. The video showcases the MSU Federal Credit Union Institute for Arts and Creativity at Wharton Center, where dozens of schools integrate performing arts into the curriculum. Served as the communications firm of record for the School of Human Resources and Labor Relations as an extension of its staff. Assembled a documentary history of computing video for MSU’s Academic Computing and Network Services (now known as Academic Technology Services), spanning 50 years of technological evolution. Crafted web content for the Eli Broad School of Business online learning programs. Produced events for the Eli and Edythe Broad Art Museum. Created story-telling videos for the MSU College of Veterinary Medicine as well as the MSU College of Nursing, the latter which includes the Mothers in Motion video series for low income moms learning nutrition skills for their families. Produced video for Michigan State’s two schools of human medicine – the MSU College of Human Medicine and the MSU College of Osteopathic Medicine – including the residency experiences of its students with McLaren Health Care and Sparrow Health System. By maintaining “consistency of message” as Michigan State University communicates to the public, and thoroughly embracing its rich 160-year history as both a land grant university and international leader in higher education, Terry and his team (many whom are Michigan State University graduates) anticipate a strong working relationship between his alma mater and MessageMakers for many years to come.